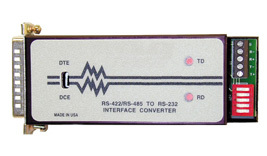 The CAT-285 is a unique interface converter that can be configured by the user to convert either RS-422 or RS-485 to RS-232. When operating in RS-485 mode, the CAT-285 has an “intelligent” mode which provides control of the RS-485 line. When configured to operate as an RS-232 to RS-422 interface converter, the CAT-285 converts full duplex data, Td and Rd, between RS-232 and RS-422. As an RS-232 to RS-485 converter, the unit can be configured for either 2 or 4-wire operation. In either mode, the CAT-285 allows control of the transmitter so that multi-dropped operation can be accommodated. The CAT-285 can be configured to control its data flow in one of two ways. The first is via the use of RTS, pin 4, of the RS-232 port. In this case, the RS-485 transmitter will turn ON when RTS is turned on. When RTS is OFF, the CAT-285 is in the receive mode. In the 4-wire mode, the receiver is always on. The second method of controlling the RS-485 transmitter is to turn it on when Td data is applied to the RS-232 port. The receiver also operates differently depending on whether the mode is 2 or 4-wire. In the 2-wire mode, when no data is received by the RS-232 receiver, the RS-485 receiver is switched ON. When data is detected for transmission, the receiver is switched OFF. In the 4-wire mode, the RS-485 receiver is constantly ON while the transmitter is switched as required. The CAT-285 is equipped with a five position dip switch that is used to select the following: RS-422 mode: 4-wire RS-485 mode: 2-wire RS-485 mode: 4-wire RS-485 mode: controlled by RTS RS-485 mode: controlled by data 220 ohm terminator: in or out The CAT-285 is also equipped with a DTE/DCE switch to allow reversing pins 2 and 3 on the RS-232 interface. Td and Rd LED indicators help verify operation. For complete product specifications see the Related Links section at the bottom of this page. † All prices on this site are shown in Thai Baht.